(20742.72, Oklahoma Historical Society Photograph Collection, OHS). (17903, Marshall Gettys Collection, OHS). The Choctaw County seat, Hugo is located in the center of the county nine miles north of the Texas line. The city sits at the junction of U.S. Highways 271 and 70 and at the southern terminus of the Indian Nation Turnpike. In 1831 the Choctaw began arriving in the region after being forced from the southeastern United States. In 1824 the U.S. Army had established Fort Towson, and in 1848 the Presbyterians established the forerunner of the Goodland Indian Orphanage in the area. East of present Hugo, Robert M. Jones owned a plantation and mansion, which burned in 1912. In 1886–87 the St. Louis and San Francisco Railway (Frisco) built a line through present Choctaw County from Fort Smith, Arkansas. In 1901–03 the Arkansas and Choctaw Railroad, eventually obtained by the Frisco, constructed an east-west line, crossing the existing tracks at Hugo. Founded in late 1901, the town name honored French novelist Victor Hugo. By 1910 the population stood at 4,582, and the town boasted two newspapers, four banks, hotels, electricity, water and sewer utilities, and numerous retail stores. The American Creosoting Company operated a large plant. The fertile land created strong agricultural (mainly cotton), ranching, and timber industries. The population climbed to 6,368 in 1920, but the Great Depression slowed the area's economic growth, closing three banks, and by 1930 the number of residents had dropped to 5,272. In the late 1930s Hugo started to grow again, reaching a 1940 population of 5,909. In 1939 the town housed 111 retail stores (including restaurants), achieving over $2 million in business. The region's mild climate attracted circuses, to use Hugo as winter quarters. Since 1942 fifteen different circuses have headquartered in the town. At the end of the twentieth century the Kelly Miller and the Carson and Barnes circuses still used the community as their base. In the 1970s the Kiamichi Technology Center opened, as well as the "Agriplex," originally the Choctaw County Agricultural Center. It replaced county fairgrounds buildings that had burned. Also late in that decade the Choctaw Memorial Hospital underwent major expansion. In 1974 the Corps of Engineers constructed the Hugo Dam, creating Hugo Lake northeast of the city. The lake provided flood control, water supply, and recreation. Roebuck Lake, one of Oklahoma's largest natural lakes, lies south of town. The 1970 population of 6,585 climbed to 7,172 by the end of the decade. In 1960 the Showman's Rest portion of Mt. Olivet Cemetery was reserved for performers, and circus owner D. R. Miller and rodeo cowboys Freckles Brown, Lane Frost, and Todd Whatley are a few of those interred there. In 1969 Bill Grant initiated the annual Bill Grant Bluegrass Festival. Hugo restored its Frisco Depot, opening it as a museum to the public in 1981. It became a popular attraction as the Frisco Depot Museum and Harvey House Restaurant. The Hugo Heritage Railroad has regularly offered excursions. 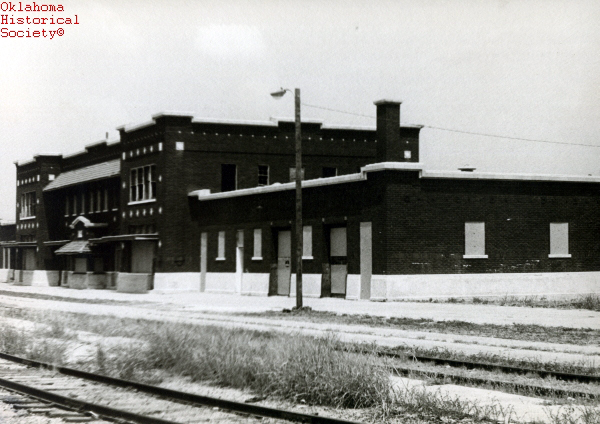 The depot (NR 80003259) is one of four Hugo properties listed in the National Register of Historic Places, joined by the Hugo National Guard Armory (NR 88001378), the Hugo Historic District (NR 80003260), and the Hugo Public Library (NR 88001379). The Everidge Cabin and Cemetery (NR 82003674) and the Speer School (NR 88001380) are also National Register listings in the area. In 1995 the town switched to a council-manager form of city government. 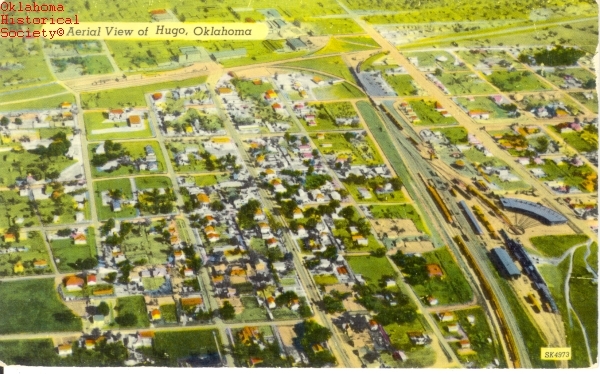 At the beginning of the twenty-first century Hugo enjoyed the amenities of most cities its size (population 5,536), including a new Wal-Mart, numerous fast food restaurants, and many retail stores. In October 2001 the town held a large centennial celebration. The 2010 census recorded a population of 5,310. "Hugo," Vertical Files, Research Division, Oklahoma Historical Society, Oklahoma City. Hugo (Oklahoma) Daily News, 25 October 2001. Hugo (Oklahoma) Husonian, 8 March 1906. George H. Shirk, Oklahoma Place Names (2d ed. ; Norman: University of Oklahoma, 1974). A Social and Economic Survey of Six Counties in Southeastern Oklahoma: Atoka, Bryan, Choctaw, Coal, McCurtain, and Pushmataha Counties (Norman: University of Oklahoma, 1946). Larry O'Dell, "Hugo," The Encyclopedia of Oklahoma History and Culture, https://www.okhistory.org/publications/enc/entry.php?entry=HU010.